For Honor’s handling of multiplayer is causing frustrations for some players as lag rears its head, ruining fights and disrupting matches in the online melee fighting game. Lag is to be expected in online experiences, as player connection speeds vary, but For Honor is drawing particular scrutiny from its player base. The main source of concern centers on how the game handles its online matches. It does not use dedicated servers. All matches are handled on a peer to peer basis. Peer to peer is one way that online games function. With peer to peer, there is no dedicated server tracking player information. Rather, an individual’s client is designated as the game’s host. While this is cheaper than having numerous servers, it has the potential to create more lag, particularly if the host does not have a great connection. For the host, everything seems fine; for others, it can be a mess. This set up creates a lot of trouble for a game as technical as For Honor. Dueling relies of proper hit detection and fast player reflexes. If one player is advantaged over the other because of a better connection, the fight is hardly fair. There are further issues. Any time a host leaves or their connection is disrupted, the game needs to either find a new host or reconnect to the old one. This pauses the entire match. In the video above, Battle(non)sense also found that the network lag between two players in For Honor is higher than most games at an average of 110 ms. These numbers will inflate even more based on how fast each player is sending data to the host. This means that the perceived lag between players can be quite high and affect the outcome of fights. As the first video suggests, peer to peer games like For Honor are also more susceptible to cheating through the use of devices called lag switches. By throttling their internet connection, hosts can get free hits and clean movement on enemies. The host can be lagging all over the place for everyone else, but because the match is using their client to decide what is or isn’t a valid attack, they can still get in clean hits. Kotaku has reached out to Ubisoft for comment about these issues, and we’ll update if we hear back. 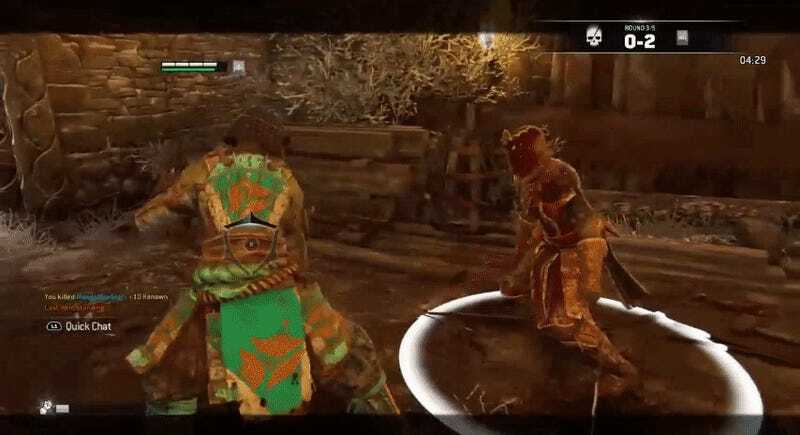 Speaking from personal experience, I’ve focused exclusively on dueling in For Honor. It’s a lot of fun but the two player limit can demonstrate how hosts have certain advantages. In most cases, the matches seem fair. However, there are moments when either myself or my opponent was clearly benefitting from being the host. There are sudden pausing before I slam my sword into someone’s chest right through their guard, or attacks that magically reach into my dodge distance regardless of timing. These moments of lag mar an otherwise exciting experience. Our team is aware that some players are experiencing disconnections and other connectivity issues that impact their multiplayer matches in For Honor. We are continually gathering data and community feedback to improve our connectivity in order to give players a smooth experience. Network connectivity is a top priority for the team and we will have more information on our plan very soon. We often hear players talking about Host Advantage that is tied to classical P2P models. For Honor has its own network model that is different from game servers or traditional P2P where one of the players is elected as the game server (“the Host”). We don’t have a game host per se as the session host only manages the invites and handshakes of all players in that session. This is why the game can be impacted by a leaving session host, pausing the match for a brief moment until a new session host is elected, the game is synchronized and the match resumes.